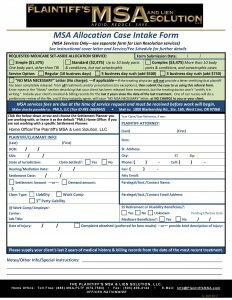 Liability Medicare Set-Aside - Settlement Professionals Inc.
An LMSA is an amount voluntarily “set aside” from a liability personal injury settlement. Specifically, to pay for injury-related, Medicare-allowable healthcare expenses during the Medicare beneficiary’s lifetime. Since this LMSA is voluntary, it caps a plaintiff’s exposure to Medicare. Thus, limiting the amount Medicare-allowable costs can claim from their settlement. The PLAINTIFF’S MSA & LIEN SOLUTION (PMLS) reduces it even further. Our specially-trained RN and MSCC nurses remove unrelated past medical and double billings, then challenge unnecessary treatments to strategically minimize the LMSA. After that, we reduce it even more. The result? More for YOU. Less for THEM.